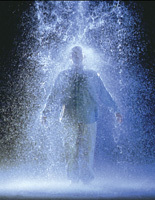 As one of the pioneers in the video arts, Bill Viola has been highly recognized internationally. 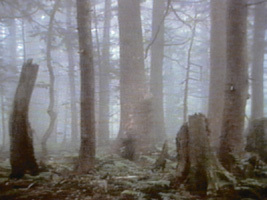 Since 1970, he has been making video arts and had numerous successful exhibitions in Europe as well as in the United States. He has worked closely with his wife and partner Kira Perov since the late 70s. The themes of most of his works, which draw people into their worlds, are the principles of human beings, “birth” and “death.” He admits that he received much influence by Japanese tradition and culture when he spent several years in Japan in the 80’s. 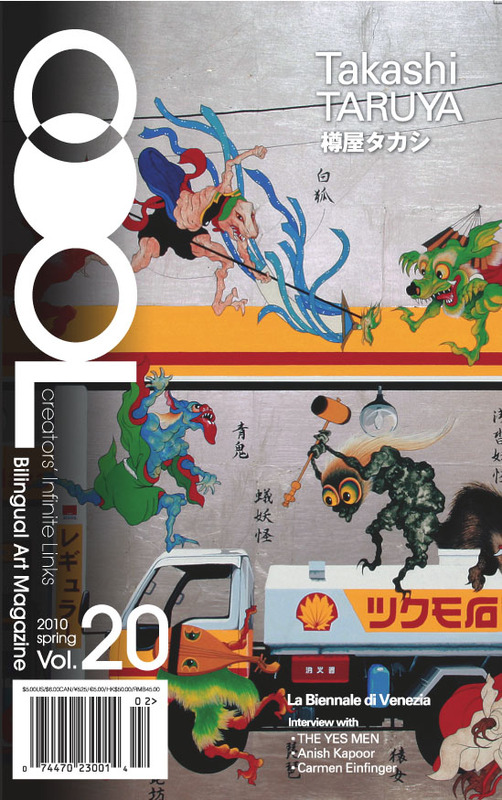 From October 14, for the first time in Asia, a large-scale retrospective exhibition has been held at the MORI ART MUSEUM in Roppongi, Tokyo. COOL got a chance to interview Viola at the studio in Long Beach, California, where now he is based. Viola speaks about his life before video arts and what his artistic activities should be. COOL: What was your childhood like? 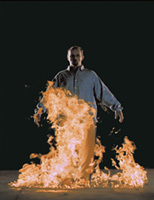 BILL VIOLA: I grew up in Queens, New York. There were so many kids of various ethnic backgrounds in that concentrated area, and we always had so many people to be with and play with. It was an incredible American mix, so diverse and wonderful. I didn't have any real experience with nature while growing up, though. My biggest memory which influenced my work was going to the beach in the summertime because I had never seen that kind of big sky and empty space in New York. That made a big impression on me. C: How did you get involved in art? B: My mom encouraged me to draw when I was 3, so I started to draw pictures of houses, boats, and people from my mind. My parents and the rest of the family, aunts and uncles and so on, were always very interested in whatever I was drawing. Then, on the very first day of kindergarten, I made a finger painting of a tornado. When the teacher saw my picture, she held it up in front of the whole class to see. Of course I felt very embarrassed because I was shy (laughs). But from that point on, that began to happen quite frequently through all grades whenever I would draw pictures. C: Who are the biggest influences for you? 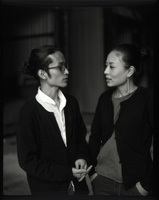 B: That's a tough question… Probably, Nam June Paik gave me the most encouragement, confidence and opportunity. He recommended me for the different grants and encouraged me to have exhibitions. I would say I was more influenced by his total life as an artist, rather than any specific works. The other person who was very influential to me was David Tudor, one of the great avant-garde musicians of the 20th century. I first met him in 1973 at a music workshop because at the time I was studying electronic music as well as visual art. I worked with him for 8 years doing performances. Though Tudor was very quiet and didn't talk so much, he was a very, very special man with strong inner being. And that was how he was teaching us, through presence. He taught me a lot about sound and space, and that greatly influenced my video making. C: In what moment do you feel pleasure as an artist? B: When I go to sleep (laughs)! I mean, for me, making art is not pleasant. There are moments when it is, but most of time it involves struggling with something unknown. When I go to bed every night in the middle of a project, I lie awake feeling very tense, thinking about what I did wrong or what I should do better. So, unlike making tables where you know when you are done, my artwork is never finished in a way. It's a lot of hard work and I never really feel satisfied. We are all, by nature, incomplete, and the artist knows a special part of that incompleteness. You make works not because you know the answer, but because of a question. You make works to fill the empty space that you feel. C: How and where do you get ideas from? B: I never really had a problem getting ideas. You see these books right there on the bookshelf? I have whole piles of notebooks filled with ideas. I know that I'm only going to make a small percentage of all the things that flow through me. The problem is the making of them. I have to decide which one is the right one to make at this time. You can think of an incredible thing in your mind, but you have to act in a physical world. If you don't act, you die. The whole question of quality is about the intention of action. C: What do you want the audience to think or feel by seeing your work? B: I don't care, as long as it is their own idea or feeling. Today, we are so used to being manipulated by the mass media that we automatically give our minds and conscious awareness to any image or enticement that comes along. For an audience member to think on their own requires a tremendous effort because they are normally never asked to do so. If people are only given coca-cola to drink and then one day someone gives them pure spring water to drink, they won't like the taste. The accommodation to avant-garde art in the 20th century was about acquiring a new taste. It takes a long time, as we have seen. People's perceiving minds normally are not open and clear. The mirror has become cloudy and dusty. The inner image has become suppressed or forgotten. In the age of experts people don't feel empowered enough to have confidence in their own ideas and opinions. They want me to explain my work to them. But whatever the personal connection you have with my work is 100% true and real. Whatever you think the work is, then that is what it is. There is no right or wrong in Art. C: Why do you often choose to use “birth” and “death” as themes for your works? B: Because these are the two basic principles of human existence. In 1988, Kira and I had our first child. I was there holding him when he was born. It was an experience that changed my life. I felt like I'd just seen a miracle. And in 1991, when my mother died, I was holding her hand at her bedside. That experience was even more shocking and difficult. Once I experienced "birth" and "death" only 3 years apart, I no longer could consider making just a static image nor allow myself to make something that was only nice to look at. After these experiences, I had to make something meaningful in terms of these profound mysteries of human life, both beautiful and disturbing. C: How do you want the audience to accept the fact of "death" ? B: What's important is not to take "death" as a negative thing. Obviously it is sad and tragic, but it's part of the natural cycle and one of the deepest teachings of human experience. C: Why do you use slow motion in your videos frequently? B: In the natural world, human beings can live for 70 or 80 years, while flies live for only a few days. All living beings have very different perceptions of time frames and time scales. There are so many things happening in our lives that are too fast or too slow for us to perceive. For example, if you are in a car accident you may only consciously realize what happened after it's over. You reflect and reconstruct what had happened in your mind afterwards. Using slow motion allows me to extend the time frame of an event while it is happening so that people can reflect and experience it in a deeper way. C: Do you think that the development of the technology has helped you expand your ways of expression? B: Absolutely. When I chose this medium in 1970, its technology was much different than what it is today. I've been lucky. As a young person, I was completely convinced that media technology would become a new global art form. Even when I was young and starting out, before this current media explosion, I had a strong feeling that I would be doing this for the rest of my life. C: Out of numerous exhibitions you’ve had, which one is the most memorable for you? B: Well… I have so many favorites… Perhaps my first major solo exhibition at The Museum of Modern Art in New York in 1979 when I was 28. That was a big step. C: How about the opera “Tristan and Isolde” in Paris in the spring of 2005? B: That was also very special. It was an exciting project of collaboration with Esa Pekka Salonen, conductor of the LA Philharmonic, theater director Peter Sellars and Richard Wagner's incredible music. I made 4 hours of video projections for it. This project will come back to Los Angeles at "Disney Hall" in April next year, and then move to Lincoln center in New York in May. C: How did your 1-year-and-a-half-long stay in Japan affect your work? B: Well, I became a "gaijin," a foreigner, when I arrived in Japan, but most importantly I learned that despite differences of race, culture, and language, we are all the same inside. It was also a big revelation for me to find out that advanced technologies and ancient traditions coexist in Japanese culture and they continue to the present. C: Why did you pick the title “Hatsuyume” for the title of your exhibition in Japan? B: Well actually Kira came up with that. It is the title of an important videotape piece called "Hatsu-Yume," which we made while we were in Japan. But I didn't want people to focus on this "Hatsu-Yume" piece too much. As the Japanese title implies, we wanted the whole exhibition to be more of an idea of "First Dream." C: Messages to your fans in Japan, please ! B: Please keep looking, keep seeing, keep feeling, and keep growing. Don't see obstacles. Only see openings! COOL: To start with, would you please tell us about the undertakings that you're currently working on? TAKASHIRO: Well, a DVD is coming out soon. While being primarily a computer-generated image creator, I've been DJing as well recently. The DVD will contain tunes I selected as a DJ and video I added as a VJ. It will be released from Universal/Def Jam on September 7. C: I know you, as a VJ, hosted an event at ageHa (a club in Shinkiba, Tokyo) the other day. How did it go? T: It sure was a wingding, I'm tellin' you. It was for the seasonal Opening of the pool on the premises, so it became sort of a poolside party filled with a whole bunch of mad people. Too many to fit in so they had to start controlling incoming guest volume later on. C: What got you started as a DJ? T: I turned 40 in summer last year where I started feeling that I should take up something new, one by one each year, and that's what. Traditionally, DJs are to perform at clubs, but I, for one, am aiming to become one that does not perform there. Per my principle, I'm always searching for a new media and a new place. I've been a "living room" artist, and in that sense, I wish to grow into a DJ whose music is playable and enjoyable at home. C: I understand that you have been VJing since your teens. What were your influences? T: I was an Art major at Nihon University, already as rebellious as I am now. I would go mouthing like "there's nothing to learn from college professors," fly to New York and see Jim Jarmusch's, Spike Lee's and such. Overseas has been a huge impact on me. I was in a great deal under the influence of the subculture and underground culture of video and music. Back in those days, Paradise Garage was the club to go and I would hit the place week after week in late 80's. T: Do the same stuff as them and I'd be stuck in the 80's. I'd rather Move ahead and make good use of technologies and media of the leading edge, while keeping in touch with their analog spirits. T: I would call it creating rather than working. About 4 hours and a half of sleep works the best. C: I believe it's safe to say that you employ and practice new things at all times. How do you manage the time for collecting information and working on ideas? Gaining information on the internet deludes you into thinking you Have come to know already so much about it just from reading it that there's no need for you to actually go out and experience it. I call that "inf-obesity." [Laugh] When you stop that way of information consumption, you'd want to get real live information. You'd get your idea about it by experiencing it. Frankly speaking, I think it's time for us to stop collecting information, time to discard it and keep only necessary pieces. Inspirations have already been inside us, or you get one or two of those spontaneously on the spot by hands-on experiences. Isn't that enough? Post-its of notes.) Thus, I keep a pocketful of ideas in here all the time and am realizing them one by one. C: Any reason why Post-it? phone, 'cause the adhesive keeps it from moving around. Besides, though it's kinda untidy pieces of crap, yet colorful ones. Pretty, one might say. [Laugh] I'm making no sense what so ever here, I know. Anyways, I'm not really one of those fancy fellas you see in the industry. C: Where did your title "Hyper Media Creater" come from? T: As a student at university, I had already had my hands broadly on images, music, graphic design, media promotion and so on. One time, a reporter on a newspaper came visit the university to interview me. He said it was not quite appropriate to refer to me as a film director or a TV director, then he came up with the title which what I had been doing appropriately fell under. It's my identity that I express myself widely on a level beyond the concept of media I have gone through such as print, mobile, television and live. This year, I went to New York in January for shoots for a Documentary movie of A Bathing Ape in Soho which I've been producing. On a side note, their close neighbor, Louis Vuitton, is another client of mine. (Mr. Takashiro produced the Louis Vuitton-Takashi Murakami animation film "SUPERFLAT MONOGRAM.") I support A Bathing Ape as a leading worldwide brand name that's out from Japan. C: Being globally successful, you've been to all over the world. Where's your favorite place? T: Tokyo. The city I belong to. I like Japan and I enjoy Japan. I was going around Europe like Greece until a week ago. Yesterday I was on location in Shonan and was hanging out at one of the teahouses on the beach afterwards. Next, I'm going to Hokkaido this weekend. I was doing promotion for Okinawa and its tourism for a while and it went quite well, so I might do Hokkaido next. Creators and artists do two things at base: to "create" and to "create and convey." In the past, all we had to do was to "create," but today, in addition to "create," we are expected to give thoughts to how we "create and convey" our intentions. As far as I'm concerned, I "create," "create and convey," and furthermore I "convey," that is, to convey what's already there. There have been quite many commissions where my expertise as a media and communication specialist is all the clients ask for in sending out their messages. After all, creating boils down to communicating. In jobs like promoting Okinawa, all my responsibility is just to "convey," because enough is already there ready to be brought to public attention. The beautiful seas, a lot of good food, fun stuff... My clients demand the art of conveying in my way. I don't have much of ego like, "I'm an artist and do not do commercials." As long as my schedule allows, I do take jobs of a wide variety, even small ones, and get one job done to another. C: Is there any difference you feel between New York and Tokyo in the feedback and opinions about you that you receive from people? T: I don't believe there is anymore. Born in Shibamata, Katsushika in Tokyo, I'm all Japanese from head to heel and in love with Japan head over heels and traveling around all over the country all the time. So I sort of feel if I'm not accepted in Japan, neither will I in New York. Japanese is doing great in the world. C: As a kid, what did you wish to become? C: How about your current dream? Anyhow, the nature of the jobs brought in is diverse, but I'll just get one down to another, that's all. Being a big fan of Star Wars, I think of my life in three parts, Like Greek myths as well. In Part I, I discover a different myself and realize the life I have led is false. In Part II, I devote myself towards what I really must do, accomplish them, and meet various people on a journey I continue on. In Part III, I finish the last work and finish my life complete. Perhaps, I'm somewhere towards the end of Part II at the moment. Still on the journey. T: I'm publishing a book on my thoughts to what could be subsequence to digital. It’s the first book I've written in the last eight years. I'm doing tons of digital works, of course, so some might way, "What? Thought you'd be the last person to be thinking something like that." [Laugh] I'd really like you Japanese to read it as it's something like I'm introducing new concepts to the Japanese. There's a book I recently read and was impressed with, which is by an author whose name is Mark Lehnardt. He is a man of vision by profession who’s impacted Britain considerably by observing his ideas on the country’s outlook and dreams. I wish to deliver a new vision and dreams for Japan as impressive as his. I'm also into body training right now. My body fat percentage reads about 7% at the moment. I realize myself being at the gym working out all the time. Strengthening body improves your mobility and gets me further. Filmmaker / Hyper Media Creator / Captain of Future Pirates, Inc. / supervisor of Toei Animation, Inc.
Born in Shibamata, Katsushika. A Grand Prix winner at the International Video Biennale, the nation’s largest video art competition held in Tokyo. Following the debut, nationwide and worldwide attention has increasingly been drawn to the image creator of the digital age. An animation film by Louis Vuitton and Takashi Murakami, "SUPERFLAT MONOGRAM" shown at 300 store locations worldwide, is a recent production. The new century’s artist, Masakatsu Takagi, works in several mediums, animation, electronic music, and video art in Japan. He exhibits his works at various places, such as Apple Store worldwide, 21st Century of Contemporary Art in Kanazawa, Museum of Contemporary Art in Tokyo, and the Agnes B store also in Tokyo. He went on tour with the group, Sketch Show, whose members include Haruomi Hosono and Yukihiro Takahashi. He also jointed David Silvia’s live tour in the U.S. and Europe. He has created promotion videos for two solo musicians, Yuki and UA (pronounced oohah), who releases albums on German and New York’s labels. His latest exhibit, titled Masakatsu Takagi+ Saeko Takagi: Color of Empty Sky, which took a place in Transplant gallery in Chelsea from 4/29 to 5/26. This exhibit included the latest project, Color of Empty Sky, which is the collaboration work of Masakatsu Takagi and his wife, Saeko Takagi. In addition to Color of Empty Sky, Masakatus also had the exhibition on drawing, titled Zert, was held at ATM gallery. While other Masakatsu’s projects at Transplant Gallery are made with live-action footages, the animation piece, Color of Empty Sky, was made from the very beginning, including materials. It caught a lot of attention for the new front of two artists; as a result, many people visited at the galleries on the opening day. 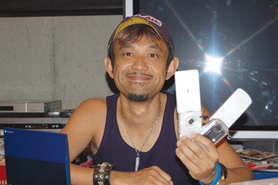 Masakatsu Takagi was nice enough to sit down for Cool Magazine interview during his busy schedule. COOL: Can you tell me briefly about yourself and career? Masakatsu Takagi: I was born in 1979 and am from Kyoto. I was majoring in English at University of Foreign Studies, but I dropped out after a year. At that time, I was making a free paper, like a magazine, with the people I met at the college. I sometimes included an audiocassette in that free magazine. To my surprise, the magazine won the FM Radio Award. I was also doing photography at that time, so we decided to add some motion pictures to the music, which our members were making. Although, I started working on video like the extension of photography, I began enjoying it a lot. I had about twelve footages, after I continued working on video for a year. The people in Tokyo happened to see my work. I then started releasing moving images on DVD. Since then, I began doing live performance at clubs. I had enormous positive feedback to the live performances. My sense of professionalism rapidly rose. I was not interested in clubs and techno to begin with, so I began creating music and screen images as my creation. At first, the music was only extra for the screen images, but there were a good number of people who said that my music was good. Right now, I do both music and video picture. C: For your current exhibition, you displayed at Transplant Gallery; and your wife, Saeko, did at ATM Gallery, both at the same time. Can you tell me the process of these exhibitions? MT: The opportunity of exhibiting at ATM came first. As for Transplant, I’ve known them for some time because they have my DVDs placed at their gallery, so, taking this opportunity, we decided to do two exhibitors at the same time. Also, I wanted to show the promotion video, which I created for UA, as one of my creation at museums and galleries. C: What was the reason to collaborate with UA? MT: UA saw my DVD piece World is So Beautiful. I had the offer from her. When I showed her the first project Lightning, which I created for UA, she told me it was different from what she thought (laugh). She told me that she was expecting that her promotional video was going to be like World is So Beautiful. She eventually said OK when the video was completed. I made Lightning after I had its proposal from UA, but as for the second project Color of Empty Sky, I approached her with the idea. Therefore, I created the second of UA’s project as one of my own project, so it was more like I borrowed her music. During the process of creating Lightning, I always made sure the UA’s ideas were included. On the other hand, Color of Empty Sky was constructed by all my ideas. C: Were there no communications involved in the process of creating Lightning? MT: Lightning was a promotional video, so of course I had meeting with UA. She created her song, imagining that she was in light with absolutely no shadows. This image differed from my perception of the song. Also, I was understating Lightning as “flare,” but it was actually “lightning” as in thunderstorm (laugh). From that time on, we discussed many times. C: I think most of your work has done by a computer and live-action image. Compared with that, your piece this time is a little different, isn’t it? MT: In the past, I was creating my work based on the moving pictures that I shot. After I created the videos for UA, I changed the formats and created some pieces, even though I was doing it in the same way. C: World is So Beautiful was originally made for Agnes B (a retail store). What was the reason for that? MT: A person who worked at Agnes B saw my work by chance. Agnes B in Japan just wanted to do something related to arts. Then, they got an approval from Agnes B’s head office in France. There were no precedents; therefore, I could freely work on the project. Since I really liked the atmosphere in Agnes B’s store before I took a part in that project, I always thought it would be great if my video picture was placed there. C: Can you tell me a bit about “Birdland” in World is So Beautiful? MT: I always get an idea in the middle of working on a project, after I started working on a project. Firstly, I add color onto the images I shot; and I try something I can do with it technically. If it’s a series, something like a total theme in simple Chinese characters comes up in my head. For example, sometimes it’s 成長(growth), 発芽(germination), or 飛躍(rise). It’s always related to explosive energy. If I see my screen image in terms of process, I always leave rough parts, like only the first one-minute. I like to see how that develops. I always have the feeling that I want to reach the place where I never imagined. I do not want to make the piece that has a solid concept from the beginning to the end. It’s more like showing one picture in five minutes’ footage. I want to include the drafts that cannot be seen in the final stage. Unlike making more high quality piece than the first image, when you entirely look at my piece, I want you to have the same impression as you see one picture. As for “Birdland,” I just had the rough idea by looking at people’s movements and images of birds. I don’t decide everything from the beginning, so sometimes; I make silly things (laugh). C: Where do you get the inspiration for your work? MT: Travel. I travel three or four times a year. I just came back from Nepal. When traveling, I come up with about two ideas, especially in sketching and taking memos. I don’t shoot while at traveling. However, if the thing I saw during my trip stuck in my mind for a long time, it comes out as my project after at least half a year or a year. When I shoot, the inspiration from my trip pushes me to do something without my consciousness. Inspiration needs to be fermented once. Also, I have to be in a trance like condition; it’s me, but it’s not. Without that complicated feeling, I can’t think of my work. C: You are doing various things, such as electronic music and video arts, and also joining other artist’s live tours. What is your first priority? MT: I don't have any special preferences. I just do it when I want to do it. My feeling of what I want to create changes. If I concentrated on one part very hard, I always begin to feel that another part is annoying (laugh). C: Can you tell me about your eighth DVD, Coieda? MT: I made this over a year ago. This is the latest of all my DVDs released in the past. Each of my pieces created before Coieda has a different taste. One has computer sounds; one has the sound of musical instruments; another one has songs, so it is more like pop music. They are all separated, no association. My projects were made depending on my egotistic feeling, so each project has totally different taste. For Coieda, I gathered everything that I separated, so it’s a more concrete piece. It’s a comprehensive compilation of my DVD creations for four years. As for the moving picture, I spit all my thoughts out in World is so Beautiful, so I can feel that I’ve begun making the pieces that have the new style. Coieda was the turning point. C: What are you planning to do in the future? MT: I saw several pieces done by great artists at museums in New York City after a long absence. And then I thought about this: I was only in a very small world. So, I thought it would be great if I became number one in that small world because I am still young, but for the first time I felt strongly that I have to work on the equal stage from now on with those great people who are in their 40’s and 50’s.